If the link between colonial imaginations of Australasia as a distinct world region can be seen to neatly translate onto contemporary scientific classification and nomenclature, the story is not nearly so simple in the spheres of politics and society. Most simply, there is no clear wisdom on what countries are contained in the geopolitical entity known as Australasia, and whether it – rather than other groupings such as Oceania – is the most accurate moniker for the ‘sixth’ continent (after Asia, Africa, Europe, North and South America). 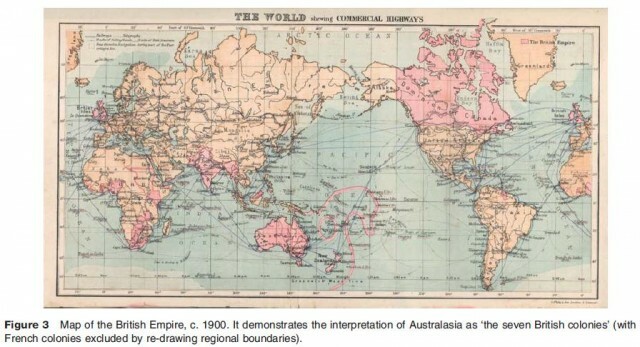 Many textbooks and maps depict Australia alone as a continent, leaving other parts of the Pacific continent less. Others deploy Australasia or Oceania as ‘catchall’ phrases to refer to Australia, New Zealand, and other landmasses of the Pacific not subsumed as part of other continents. This fluidity reflects changing meanings over the past 250 years. What was known as Australasie in de Brosses’ age took on another, more specific meaning in the late 1700s and early 1800s, as its more expansive definition (‘south of Asia’) contracted in ordinary parlance to become ‘the seven British colonies of Australasia’, meaning New South Wales (‘‘the Mother Colony of Australia,’’ as described in one school textbook from the early twentieth century), Victoria, Queensland, South Australia, Western Australia, Tasmania, and New Zealand (Figure 3). This was the dominant meaning for ‘Australasia’ up until the 1901 Federation of Australian colonies (from which the contemporary Commonwealth of Australia derives). 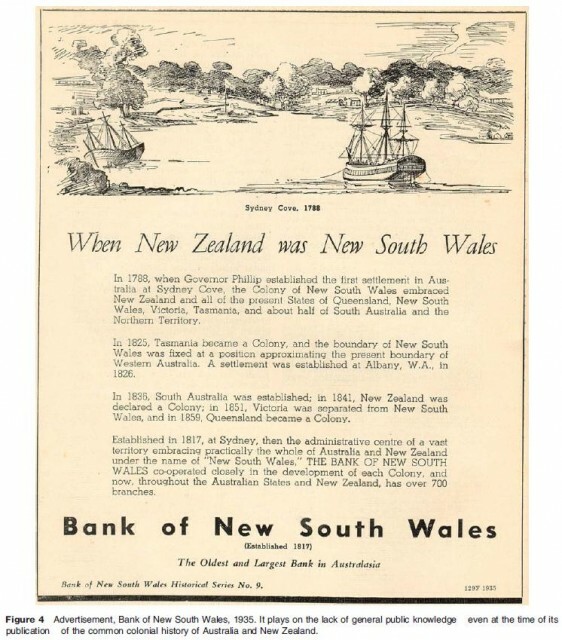 Indeed, up until it became a separate colony in 1840, New Zealand was administered as part of New South Wales, and even after this time it was considered part of a single British presence in the Antipodes (see Figure 4). Thus, New Zealand was included in conventions held in the 1890s in which federation of all these colonies was discussed. New Zealand bowed out of such discussions and became an autonomous country. There are numerous theories as to why: New Zealanders held fears at the time of being ignored or exploited if governed from the Australian mainland at such a distance; there was also growing nationalism and a sense of superiority over the Australian colonies (a result of the self perception of racial purity, stemming from the lack of convicts in New Zealand), as well as questions about the benefits of international, rather than inter colony trade. After Australia and New Zealand became separate sovereign nation states, the term Australasia largely fell from use within those countries, especially in New Zealand. Separate trajectories of nationalism and development had emerged and new kinds of geopolitical distinctions and logics were set in train. The Royal Geographical Society of Australasia, established as an offshoot of the Royal Society of New South Wales – and which at its height sponsored expeditions to Antarctica and New Guinea – fragmented into branches for each of the distinct colonies. Separate national geographical organizations were established for Australia and New Zealand (the Institute of Australian Geographers and the New Zealand Geographical Society), and a very different set of goals and intellectual endeavors emerged, driven instead by new metropolitan geography departments, and national and state based curricula. School textbooks taught distinct and unique histories and geographies, and rivalries grew in sport, academia, and the arts (indeed, people promptly forgot that New Zealand and Australia fielded combined teams at the Olympic Games of 1908 and 1912, under the banner ‘Australasia’). The newly imagined separation was so effective that some scholars have since argued that ‘Australasia’ – abandoned as a meaningful geopolitical category in the twentieth century – became little more than a moniker for a ‘repressed’ shared memory, as New Zealand and Australia each subsequently sought to emphasize distinct national cultures. Hence, in The Geography of New Zealand : Historical, Physical, Political and Commercial (c. 1904) by P. Marshall, ‘Australasia’ did not earn an index entry. Its historical section described New Zealand’s ‘discovery’ and colonization separate from that of Australia; and stressed the physical geographical uniqueness of New Zealand: ‘‘New Zealand is a continental island that has been isolated from neighbouring continents for an enormous lapse of time. In consequence of this its flora and fauna are widely different from those of any other land in existence’’ (P. Marshall, 1904: 247); and ‘‘two thirds of the indigenous plants are absolutely confined to New Zealand in their distribution’’ (P. Marshall, 1904: 255). Yet as a descriptive term for this part of the world, the term Australasia has lingered on in different ways. In Britain, a long way from Australia and New Zealand and their respective nationalisms, the term has not seemed to lose its usefulness as a general descriptor and was continually employed throughout the twentieth century without regard for its redundancy in the South. 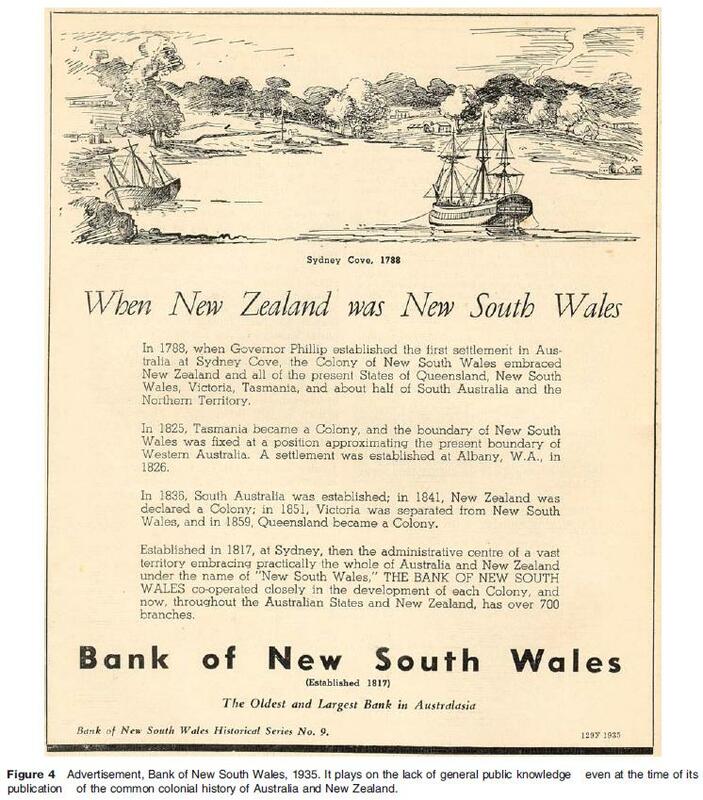 Administrative matters were often still conducted with regard to ‘Australasia’, and records of trade, exports, and imports through the colonial network still referred to ‘British Australasia’ well into the twentieth century. Colonial imaginings of Australasian peoples and natures as perverse or despoiled also lingered; thus school textbooks such as the Class Book of Modern Geography described Australian Aboriginal tribes as ‘‘among the most degraded members of the human race. A few roots and berries, with shell fish, insects, grubs, and other repulsive objects, form the food resources of the Australian savage, who will eat almost anything – lizards, snakes, and frogs being especially esteemed, while most of the wilder tribes are also cannibals, not from necessity, but from choicey they are gradually dying out, although it probably will be a long time before they are entirely extinct’’. British ignorance of local circumstances on the other side of the world combined with persistent myths of Australasia as inversion of European civilization. In Australia in the 1990s the name Australasia took on another meaning in the context of an increasing ‘push into Asia’. This was spearheaded by then prime minister Paul Keating, who courted Asian leaders, encouraged closer military and economic ties with key states (notably Japan, Singapore, Thailand, and Indonesia), and altered immigration laws in ways that enabled more extensive flows of new settlers and overseas students from Asia. Australasia had crept back into partial use as a means to describe a more fluid world region of exchanges and interactions between an ex British, postcolonial Australia and modern, rapidly developing ‘Asian Tiger’ nations. Although the subsequent conservative government reversed the focus on Asia when elected in 1996 (ushering in a more inward looking, even xenophobic, perspective), many Australians continued to think that ‘Australasia’ meant ‘Australia as a part of Asia’. Indeed, the Australian Oxford Dictionary still wrongly cites the origin of Australasia as a conjunction of ‘‘AustraliaþAsia,’’ reflecting this misnomer. Mostly, though, Australasia is a word that people in the Pacific know of, but which has fallen from their regular use. In formal arenas, it has largely been replaced by Oceania, including in international diplomacy and sport (as in Federation Internationale de Football Association (FIFA)’s football confederations); and debates about whether Australia by itself is or is not a continent have largely subsided, remaining unresolved. For many residents in those countries that have at one time or another been officially considered part of Australasia, it matters little whether there is an overarching name for a continent to which they belong – or what it might be. People in this part of the world do have a sense of belonging to a South Pacific region including large and small countries, culturally diverse groups, and thousands of islands. But this sense of regionalism is rather loose and contradictory. The Australian and New Zealand governments have, at different times, intervened heavily in the geopolitical affairs of region, sending peacekeeping forces, police staff, and diplomats in times of crisis, ethnic tensions, and political instability (as happened recently in East Timor, the Solomon Islands, and Bougainville). John Howard, the Australian prime minister until 2007, for instance, described Australasia as ‘‘our patch, we have a special responsibility in this part of the world, I believe very strongly and this is our region’’ (quoted in Connell, 2006: 111). But by and large, Australians (and perhaps less so Kiwis) do not hold the same feelings of belonging to a coherent larger continent in the way that Africans or Europeans might. Fijians or Samoans might hold allegiance to pan Pacific island identities, but probably would not to an Australasian identity. Kanaky from New Caledonia have more of an allegiance to other Melanesian nations than to English speaking Australasia (or indeed to France), and other tribal identities remain much stronger than wider regional ones. Where it is still used, Australasia has become a simple referent for just Australia and New Zealand. It is now most common as an adjunct to the names of hundreds of nongovernment and representative organizations who happen to have offices and activities in the two countries, whether scholarly (Australasian Quaternary Association, Australasian International Studies Association, etc. ), leisurely (Professional Divers Association of Australasia), mundane (Plywood Association of Australasia), or bizarre (Biggles Association of Australasia). Uneven contemporary uses of ‘Australasia’ are thus matters of convenience and applicability. But they also reveal traces of a colonial past, and a shifting geographical imagination influenced by increasing internationalization and interconnectivity.